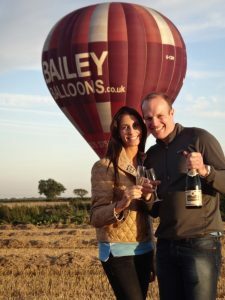 If you are eager to propose to your loved one and are looking for an especially unique and romantic way to pop the question, what could be better than doing it while aboard a champagne hot air balloon ride over the stunning sceney of the South West. Imagine flying over the beautiful countryside of Dorset, Wiltshire, Somerset, Devon or Cornwall! Your fiancé will be the envy of all his/her friends and will be telling the story of how you proposed to him/her whilst floating through the clouds in a hot air balloon for years to come! 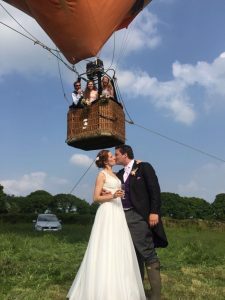 If you are looking for a way to make your special day even more unique, why not surprise your family and friends with a dramatic exit from your wedding or reception in a hot air balloon! Lifting up into the sky and through the clouds and then sharing a glass or two of champagne would be the perfect way to begin your journey as a married couple. A Tethered Balloon provides a spectacular setting and fabulous entertainment for your guests at your wedding. Previous Brides and Grooms have been thrilled with the popularity of the tethered balloon at their wedding. If you are unsure of what to get for a family member or close friend, a champagne hot air balloon flight would offer them a romantic and exciting experience that they can enjoy together. Reminiscing about their magical day whilst making a toast to lifelong happinness would be the perfect way to relax as a newly wedded couple. If you are struggling to find a way to celebrate this special day, you can celebrate it in style with our champagne hot air balloon flight, whether it’s from your hotel or from one of our specially selected launch sites. We can personalise the gift voucher with your anniversary message, beautifully printed onto the flight voucher, a memento that will be cherished forever. In the U.K. it is not yet possible to be legally married during a Hot Air Balloon flight. 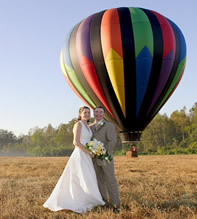 If it is your dream to marry whilst drifting over beautiful countryside Aerosaurus Balloons can make that possible in Florida. Transportation from your local hotel to the launch site. Notary and wedding ceremony on the ground or during flight. One-hour balloon flight in a private balloon for two. Full buffet breakfast and a wedding cake. Flight certificate and a photograph of the balloon in a souvenir folder. Extra passengers for the balloon flight. Photographs of the event (36 pictures). Stretch Limo (up to 4 hours). Flowers for the bride & groom. We can advise on local hotel accommodation. Reservations are made a minimum of two weeks in advance. Reservations are confirmed with a 50% deposit. The balance must be cleared prior to the ceremony/flight. Flights are weather permitting however owing to its wonderful climate flights take place on average 26 days per month in Florida. Should weather conditions be unfavourable the flight will be rescheduled at the earliest available date. Wedding attire is permitted, however you will be expected to climb in and out of the balloon and we will be out in open fields.